An Interview with Mark Algee-Hewitt of the Stanford Literary Lab | What Is A Media Lab? HS: Who uses the lab? Is it a space for students, for researchers, for artists, for seminars? MA-H: The question of ‘use’ is a complicated one. The membership of the lab includes a few faculty from primarily English and History, two staff research positions, a diverse population of graduate students, undergraduate researchers, and a handful of outside scholars. The lab space is used for meetings among members of various projects, and for our group lab meetings that we hold four or five times a quarter. We have held seminars there as well. All members of the lab, but only members of the lab, have free use of the space for their individual needs. A different way, however, to think about the question of ‘use’ lies in the role that the lab plays within the English department and the larger university community. As the only group of our kind at the university, we provide intellectual support for a variety of scholars across campus, the country, and around the world. Our members become members not through recruitment, but because they are interested in the kind of work that we do, because they have questions that can best be answered through computational means and because they seek collaborators for projects that are potentially interesting to the other members of the lab. A faculty member, a graduate student, or an outside researcher, who comes to us to collaborate on a project all ‘use’ the lab in different ways (for intellectual support, to find like-minded researchers, do discuss their findings), but all share in our resources and contribute to the whole. When I say that the resources and facilities of the lab are only available for use by members of the lab, it is this capacious type of membership that I have in mind. HS: What sorts of knowledge does the lab produce (writing, demonstrations, patents etc.) and how is it circulated (e.g. conference papers, pamphlets, books, videos, social media)? MA-H: The primary knowledge production of the lab lies in its contribution to research and scholarship on Literary history and criticism. Our findings are disseminated primarily through our pamphlet series. The pamphlets were a deliberate choice on the part of the lab as they are all reviewed and edited, but they give us freedom, both in form and in style, to discuss the experiments, findings and process of our research in a form that is designed for this type of work. They vary widely in length, but are all image-heavy and often narrate the process of experimentation and discovery that is essential to our research. In fact, we have an outside designer who puts together the pamphlets to ensure that their content is displayed clearly and effectively. While the results of our various research projects are the chief form of knowledge that we produce, our experiments have side-effects, in the form of new methods and datasets that our new blog, Techne, is designed to disseminate. In course of projects, some participants also seek to gain a greater knowledge of the methods that we employ. To answer this need, we also run a weekly working group that offers our members and visitors a forum for learning about our research process and to gain competency in the necessary technical skills so that they can contribute to future lab projects. MA-H: When we start a project, we have questions that we want to explore and test. We do so to greater or lesser success, but those results get written up in pamphlet serious. But some projects, like our project on poetry – the history of metrical change — we wound up writing a program that parses poetic meter—syllables per line and syllabic schemes, which was not the overall goal but was a necessary step along the way. Meter is an interesting concept. Throughout history, meter has never been perfect or exact. Which is interesting insight into changes of poetic form. Those kind of results are side effects to what we intended to do. Now people can use the technology and methods that we created along the way for their own projects. We have a project on race on identity that looks at how various identities are ensued in American novels. We’ve looked at thousands of novels and have generated much more data than we could ever use. There are so many interesting things to study, like tracking names of Native American tribes. We invite academics from all over the world to participate in and use this this overflow data. In May we are inviting twelve scholars who study race and ethnicity with the hope that they’ll be able to take our data and use for their own research. We want to send our overflow information that is generated here lose in the wild and create things we couldn’t. We hope our projects will have an afterlife. HS: Tell us about your infrastructure. Do you have a designated space and how does that work? MA-H: There are three aspects to our infrastructure, which all both equally essential: space, personnel, and technology. Without any one of these, the lab could not be successful. For space, we have a designated room in the English department (the “Literary Lab”), where we hold our lab meetings, and also our various smaller project meetings. It has facilities for projecting multiple images simultaneously, as well as video-conferencing equipment All of our lab meetings have a significant ‘virtual’ attendance, as our various collaborators (past, current, and future) join our meetings via a live stream that we broadcast. The room is not large (it holds a conference table, about 20 chairs, and a computer workstation. The Literary Lab is also a founding member of the Center for Spatial and Textual Analysis (CESTA). 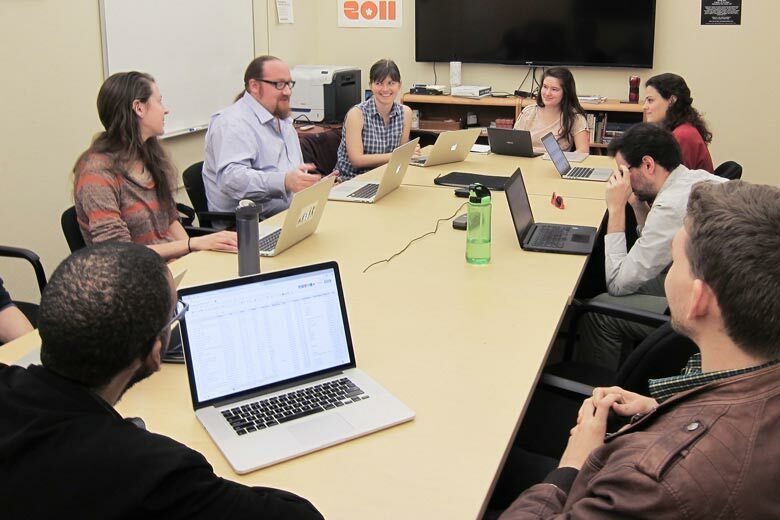 This umbrella organization provides administrative support for a number of different projects and groups on campus (including the Spatial History Project, Text Technologies, Humanities+Design, the Poetic Media Lab, etc.). CESTA is located on the top floor of Wallenberg Hall, where it has an open office plan, with multiple conference rooms. We have working space for our permanent staff, as well as temporary space for visitors there. It also has facilities large enough to host more sizeable meetings (upwards for 30). Although we make use of these shared facilities, it is also essential for us to have the unique lab space in the English department (for both disciplinary and infrastructural reasons). HS: Does “disciplinary and infrastructural reasons” refer to increasing credibility for the lab? Can you expand on why it’s necessary to attach the lab to the English department? MA-H: It’s not a credibility issue. It’s intellectually necessary. The lab emerged as a literary lab. As much as we deal with texts that aren’t literary, the way we handle them are contingent on our training. The heart of the lab is in the English department. It encourages greater collaboration with our colleges and grounds us in literary studies. The lab is on the fourth floor of our English department building and is kitty-corner to the graduate student lounge. I feel like this has been crucial to the lab’s history. We’ve been having meetings with the door open, allowing and inviting a graduate students to take interest and poke their head in and see what’s going on. Access to the faculty and graduate students gives us materiality with the department and encourages collaboration, whereas if we only had space in library, I think it would give the impression that it’s a separate thing entirely and not open to outsiders. Our collaborations tend to be primarily in literary studies. Our personnel are perhaps more crucial than our space. In addition to me, we have a Technical Director (David McClure, who does a lot of computational infrastructural work), an Assistant Director (Hannah Walser, who takes on many project management duties), a graduate student coordinator (Erik Fredner, who manages the website, takes care of logistics and manages most communications-related tasks) and two financial administrators through our association with CESTA (Amita Kumar and Rani Sharma). David, Hannah and Erik also participate in the research of the lab: in many ways, that is the most important part of their respective positions. Computationally, we have access to Stanford’s high-performance computing cluster. Although many of our experiments take place on smaller scales, with relatively few texts (numbering in the hundreds or thousands), recently, our corpora have scaled up dramatically as new text collections have become available (we now routinely work with tens or hundreds of thousands, or even millions, of texts). For projects on this scale, access to a computing cluster is essential. MA-H: We have pieced together a number of different resources over the years. Much of our early work depended on the resourcefulness and energy of a small group of researchers, particularly Franco Moretti, whose vison and tireless efforts brought the lab into being. Matt Jockers was also responsible for laying down the initial infrastructure of the lab, as well as providing many important early research contributions. But, all of this was done very locally and without much institutional or grant-based support. In fact, CESTA was founded as an attempt to unite a number of disparate groups so that they could act in concert to secure funding. But, it is important to recognize that much of the early work was done without some crucial financial support. Currently, our situation has improved, and we have a variety of sources of funding, although it still lacks the long-term stability that we require. We hold federal and international grants, both on our own, and with collaborators. These frequently fund travel and temporary salaries, but they do not answer the long-term needs of the lab. Much of our infrastructure funding comes from the University and responds to our early successes, and yet even this is temporary. And we have a small number of private donors who have given to the lab or to specific projects that interest them. HS: Jeffrey Schnapp recently visited our class and spoke about the creation of the lab. He actually attributes his decision to leave to the over-involvement of Stanford’s institutional influence. He said something like, “When you become part of the institution, you have to learn to speak the language of the institution.” According to him, Stanford’s influence in the lab undercuts creativity and collaboration. What are your thoughts? Do you agree or disagree? MA-H: He’s right insofar as that statement. There is an institutional bias because of funding. When you’re granting, apply for funding, there’s a very particular language you need to speak. We’ve received funding from Stanford but also from Melo grants, Fulbright Fellowship, NEH funding and Canadian granting. We have a variety institutional foot prints. The lab has also changed a lot since Jeff was here. The early lab was very tied to the English department – When Maretti was working with Jockers they were very streamlined and worked on one project at a time. When I — someone from the outside came to the lab– a lot changed. In 2012 I was the first outside person to work closely with the data. Now we regularly invite outsiders to join in our scholarship. We have a group from Paris, Peruvians from Vestaburg doing projects on micro novels, a group from the Netherlands coming in June. Although the lab is embedded in Stanford, we haven’t allowed it to diminish creativity with one foot firmly planted in the international digital humanities community. There are clear advantages to being anchored in a university, part of is hard and soft money. The university gives us the space to bring visiting staff and scholars. I do hear what Jeff says. If one becomes too embedded institutionally, it can disable creativity. HS: What are your major theoretical touchstones? MA-H: Certainly Franco Moretti’s work is quite literally foundational to the Literary Lab. Not only did he found it, and direct the majority of its research, but many of our collaborators and members came to the lab because they were interested in Moretti’s approach. When I decided to join the lab in 2012, I did so because I was deeply intellectually sympathetic to his research and was eager for the chance to work with him. Again, both he and I consciously prioritize our research questions over the methodological approaches emphasized by many other organizations. As such, the influences on our work are more likely to be cultural or literary scholars. When we work across disciplines, we often find ourselves looking to other fields of research, rather than engineering. That is, we have explored methods that first appeared in linguistics, anthropology or biology more often than we have sought out specifically computer science approaches. HS: What would you say is the lab’s most significant accomplishment to date? MA-H: This is difficult question, as I think it is one that needs to be asked of the field as a whole. Even our findings, which speak to traditional humanities-based research, are not easily integrated into the body of knowledge of Literary Studies, History, etc. They are, I would argue, fundamentally different, and so their impact is more difficult to assess. From a local perspective, judging from our past research work, I would argue that pamphlets 4 (“The Semantic Cohort Method”), 6 (“Operationalizing”) and 11 (“Canon/Archive”) are among the more significant contributions of the lab to the field of both Literary Studies and Digital Humanities. But, in many ways, pamphlet 1 (“Quantitative Formalism”) set a model for what a literary lab could be and do that, although still being modified, refined and improved by others, still created a standard model for many other organizations. HS: Could you briefly describe your plans for the lab over the next 3-5 years? MA-H: Plans like these depend a great deal on the status of the field and, more materially, the status of our own resources. It is still an open question, I think, whether or not the field of Digital Humanities, or even specifically quantitative or computational research in the Humanities, will become more integrated into the practice of the Humanities within their disciplinary categories, or if it will begin to fission off into a distinct field of research in and of itself. Given our own research, I hope that it is the former, as I feel our focus on Literary Study grounds the work that we do. But, it would be naïve to say that the direction of the field would not have an effect on how the lab grows and develops. Our research has begun to branch out from the literary formalism that has characterized much of the work of Digital Humanities to this point an I am eager to continue building on this. We have projects that deal with issues of both gender and ethnic representation in Literary texts currently awaiting publication. Much of our current work seeks to capture more aspects of the reader experience (whether through reading studies, or mining other kinds of textual resources). And we are actively collaborating with scholars in Political Science, Biology and Linguistics to bring the methods that we have developed for Literary research to these diverse fields. On the material side, the lab has reached a crucial stage of its growth. It has become too large and too ambitious for any one person to completely manage its work. And yet, our infrastructure funding is still tenuous, and so my most immediate goal is to secure funds to maintain our current work, and infrastructure, with the possibility that we will be growing well into the future, if not at quite the exponential pace of the past few years. Finally, it is widely acknowledged that there is an issue of diversity among the practitioners of the Digital Humanities, both in gender and in ethnicity. While this is a much larger conversation that is just now beginning to happen across the field, it is something that we in the lab are quite aware of. As such, we work to foster an environment of diversity and inclusiveness which we will continue to build upon as we grow. Our recent projects are a testament to these concerns and interests, and represent the research work of our members. We are therefore eager to continue expanding our research in these areas. HS: What makes your lab a lab? MA-H: The easy answer to this would be to look at the formal characteristics of the lab and relate it to similar labs in the natural sciences. Or to discuss the role of technology in our work, which differs from how technology has made its way into traditional literary scholarship, and create a metaphorics of the laboratory based on that. Instead, however, I think the real answer lies in two directions: experiment and collaboration. HS: Do you believe that calling your space a “lab” is a classification that brings credibility to your work? MA-H: If anything, it almost undercuts credibility from the science perspective. We want to be in conversation other disciplines in higher education. We’ve worked with the sciences but are not necessarily mimicking their practices. Biology is a real lab. What we have is not really a lab. It’s more of a metaphorical lab, and therefore does not lend any credibility from sciences. The title of “lab” is more concerned with the process of research, which is collaborative and experimental. A lab is a research space. Some are called centers, which performs a different function. Centers are where things happen. A lab is where people do things. At any given time we have a rotating cask of projects. I can’t speak for the larger humanities movement, but a lab is a particular kind of intellectual space that resonates with the work being done. What sets our work apart from that of the traditional humanities scholar is our commitment to experimentation. While we often have a hypothesis about the result of an analysis, we are steadfast in our commitment to judge the hypothesis based on the results that we achieve (rather than to design analyses to confirm or deny our initial suspicions). We may start a project with a question (What differentiates the canon from the archive? What causes suspense?) but as we create and discuss results, reformulate experiments, and iterate our methods over new materials, the question is more often reshaped by our results, than our results are shaped purely by our question. Each of our projects has about a two-year time horizon: most of this time is spent in the discussion of results and in argumentation over their interpretation. The form of our pamphlets both narrate and perform this process: this is a large part of their stated goal. We discuss our initial ideas and questions, the processes we use to test or operationalize them, the interpretation of our results and follow-up experiments and, most importantly, our failure, frustrations, and dead ends. As opposed to a purely Literary study based on a close reading analysis, we begin a project with a question, but with no sense of what we will find. Our tenth pamphlet (“On Paragraphs”) began with a search for the middle ground of computational literary analysis and ended, much to our surprise, with an argument on the paragraph as the formal unit of thematics. This dedication to experimentation, this willingness to test, to re-test, to be wrong and to have to justify our conclusions through evidence, make the Literary Lab, a lab in the best sense of the word. Equally important though, is the process of collaboration. Bruno Latour, in Laboratory Life, speaks of the nature of facts that are ‘constituted through microsocial phenomena.” If our process is one of experimentation, then our method is one of agreement, disagreement, of argument, discussion and ultimately, hopefully, convergence. It is crucial that we deal in empirical data, but the questions of which empirical data are important, and which interpretation contextualizes them within the framework of the question we seek to answer, these are elements of our process that depend upon the collaborative nature of our work. Unlike the closed circle of literary study, whose conversations occurs at the level of the discipline after publication, our results, conclusions and knowledge production, rests upon the multiple daily and hourly interactions that are facilitated and enabled by the lab.